Wake holds sovereignty over Creation, giving them the ability to make limited changes. 347 readers have been here. Creation is a part of Exalted: A Tale in the Time of Tumult. Creation itself is divided into five directions, which correspond to the five elements of Creation. The North, corresponding to the element of Air, is a frozen place, ranging from tundra to glacier the further north one goes. At the furthest extent of the land, as one wanders further into the Northern Wyld, one will eventually come to the Elemental Pole of Air, where there is nothing but frigid air as far as the eye can see. The North is populated sparsely, with a few cities and more barbarian tribes that follow the herds of elk and mammoth. The East, corresponding to the element of Wood, is a verdant place, ranging from grasslands to thick forests the further east one goes. At the furthest point is the Elemental Pole of Wood, a massive forest with trees so large, those standing at the roots cannot see their tops. The East is populated by most of the people of Creation, in a variety of cities, city-states, villages, and tribes. 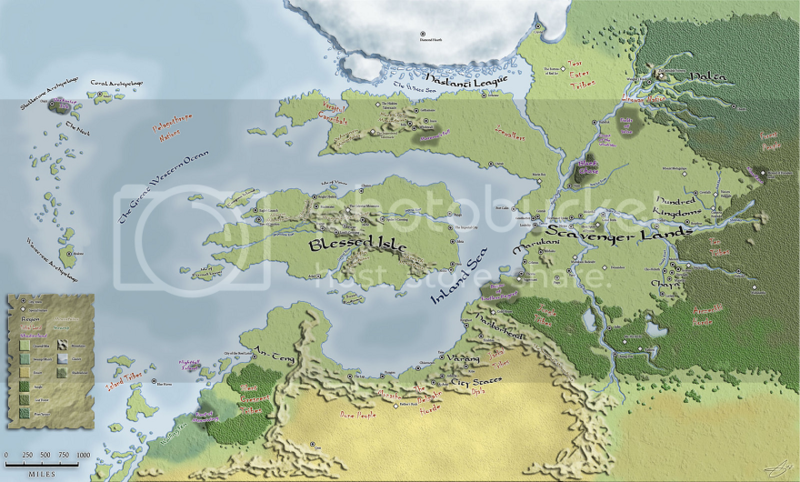 The East also technically includes the Scavenger Lands, the nations that cluster around the Inland Sea. The South, corresponding to the element of Fire, is an arid place, ranging from scrub to desert the further south one goes. At the furthest point is the Elemental Pole of Fire, where there is nothing but blistering heat and flame as far as the eye can see. The South is sparesely populated, but a few cities cluster around the sea at its northernmost point, and a few tribes of barbarians do live throughout the area. The West, corresponding to the element of Water, is mostly ocean, with some volcanic islands scattered throughout. At its furthest point is the Elemental Pole of Water, where land is but a memory, and even the sky seems made of water. There are a few city-states on some of the larger islands, and many more barbarian tribes on smaller islands, but most of the population of the West is ship-based, whether naval or piratical. Finally, the center of Creation is the Blessed Isle, corresponding to the element of Earth. This is the home of the Scarlet Dynasty of Dragon-Blooded, and it was once home to the gods themselves. At the center of the Blessed Isle is the Imperial Mountain, also known as the Elemental Pole of Earth. The land itself is stable and fertile, though not as verdant as the East. The Blessed Isle is temperate and heavily populated, and, of course, heavily protected by the Immaculate Order.